Nowadays, there several different types of phones ranging from a simple smartphone to sophisticated, expensive phones such as Samsung S8. While most mobile phone providers are trying to make cell phones affordable, the high end phones are still way too costly hence manufacturers and network providers have come up with some cell phone no credit check financing plans. These plans have made it possible for anyone to own any type of smartphone he or she wants without putting too much strain on his/her finance. In this article, we are going to discuss what cell phone financing means, how it works and lastly, we are going to explain some of the cell phone no credit check financing plans and what they entail. What is cell phone no credit check financing? Cell phone no credit check financing is a kind of mobile financing strategies that comprises of several cell phone plans that don’t involve credit checks. Some of these plans include; security deposit, use of cosigners, family plan, pre-paid carriers, sim-only contracts among others. Note that all these plans don’t require full cash payment or credit checks and hence it can be quite useful if your credit rating is not that good. It also makes it possible for anyone to get a smartphone of his desire at an affordable rate. How to works cell phone no credit check financing? When you order a phone from any provider, you are given options of how you can finance the phone. In most companies, these plans are only limited to those upmarket phones that cost around $100 and above. However, there are some companies that allow you to choose an option of financing you want, for any phone that they have, regardless of the price. Once you’ve identified the type of financing or payment you prefer, an assessment is done to determine whether you are eligible for financing. If you qualify, well and good, if not you are given other options for payments to choose from that fits your financial profile. You will also be given plans in terms of duration or length of payments to choose from i.e. 12 months, 6 months or three months. The duration varies from one cell phone provider to another. Some providers will also show you the monthly breakdowns and the service or other charges. Once you are satisfied with everything, you are then given a contract to sign which is now a bidding and legal document. Most providers provide these services online. All you have to do is visit their website, fill in your details; they will then conduct their assessment and give you their feedback. Once everything is finalized, the phone will be sent to you. Note that, there are different types of credits ranging from bad or ‘no so good’ credit to great and excellent ones. All these options are given to you and it is up to choose which one you want. Now that we’ve looked at how cell phone financing works, let’s now discuss credit scores. What is it? And how can it affect your chance of getting a phone? Simply put, a credit score is a digit that comprises three numbers. These digits or numbers are obtained from credit reports compiled by three main credit bureau that is, Equifax, TransUnion and Experian. 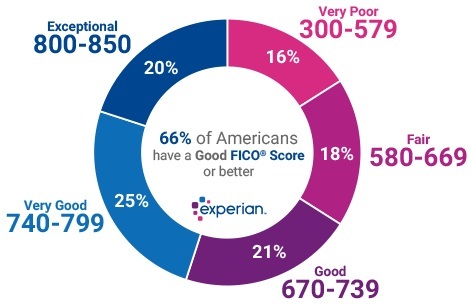 The most important and most common score is the FICO score, which is ranked on a scale ranging from 300 to 850. If your score is close to 850, your chances of getting a good loan with good interest rates are very high. If your FICO score reads below 650, then your credit score is regarded as a bad or poor credit. With this score, you are not only ineligible to a credit card, but you cannot also access any traditional loans. The only options you have here is limited to, no credit check loans and bad credit loans, some of which are okay, but the majority have some super-high fees and interests. Note however that, credit score is not completely about loans, it is also a crucial factor that is considered when applying for property or insurance plan and of course, a phone contract. How does credit score affect your chances of getting a phone? When applying for mobile phone contracts, most providers will carry out a credit check on you, as the first thing before they consider anything else. The main purpose of a credit score is basically to measure your ability to pay back and how reliable you have been in paying back your debts as well as managing your credit. If you have been consistent and timely in paying back your debts or bills, then there is a higher probability that you will also honour the phone contract you are applying for. In contrast, if you’ve had some difficulty in paying your bills, the mobile phone provider or lender will possibly think of you as a person who is likely to default and therefore, they’ll offer you a bad rate or they can as well deny you the contract. While it is true that a poor credit score does not necessarily mean that one is unreliable, it is an assumption that most providers and lenders take. Hard credit check occurs when the lender checks your scores, which usually deducts some point off your FICO score. If you were to choose, then a soft credit check would be better, unfortunately, this is beyond you and is fully dependent on the lender or the service provider. Increasing your credit ratings by, timely paying your bills, paying your debts and properly managing your credit card expenses, will enable you to have better choices when it comes to choosing phone plans. If you need a phone urgently and probably don’t have a good credit score, here are some cell phone no credit check financing options that you can consider. The first option that you have is paying money upfront for the phone. The monthly instalments can even be lower as compared to a person with a good credit. Paying upfront is a common practice among people with poor credit ratings, as it enables them to sign up for utilities, pay rent and other bills. With this option, you will need to have adequate savings. You will also need to ensure that the mobile phone you are buying has a warranty since you do not want to lose your investment if it gets damaged. There are also some service plans that offer you a prepaid plan that comprises some amount of text, data and calls. There are various plans available based on how frequently you’ll be using your mobile phone. You will also be delighted with the number of features that you can be able to access with this plan. The downside of it though is the fact that you will end up paying a lot of money as compared to other traditional phone financing plans. Most mobile phone service providers prefer to contract for obvious reasons. You see, when the service provider offers you a contract, you are essentially taking with you a brand new phone without paying a cent (upfront) and with no credit checks. But in return, you have committed yourself to pay the provider some amount of money in terms of monthly bills; and at the end of the contract, you will have paid the provider for the phone plus the service. In short, you will have taken a loan in which you will be required to have a good credit. Fortunately, though, there are quite a number of mobile service providers that have plans which don’t need the credit check. An example of such a provider is T-Mobile which has a plan that needs no credit check. The plan is known as ‘easy option with no credit checks’. The drawback to this type of plans is that they usually don’t have all the features that you would have expected in a normal contract. Another effective cell phone no credit check financing plan is the one that involves a cosigner. Some mobile phone service providers permit the use of cosigners. A Cosigner is a person who together with you will sign the loan forms, and if you miss or default on payment, the cosigner is the one who will be required to pay. You are allowed to select any person as your cosigner, be it your parent, cousin, friend or brother. This option does not require a credit check on your part, but a check will be done to establish the credibility of your cosigner. Remember that the cosigner is putting his credit ratings at risk and therefore it is important he or she understands the risks he is undertaking. You should also select somebody who trusts you. Some carriers have a family cell phone plans that allow you to have multiple (up to 10) lines on a single plan. This plan only requires a credit check from the primary account owner but those using the other lines do not. Just in case you stop paying, it is the primary account owner who will be required to pay on your behalf. The good thing about this plan is that you not only get to avoid a credit check, but you also save some few dollars. For instance, one line on the unlimited family plan is charged $65 to $85 in a traditional carrier, but if the same plan is shared by four lines, the cost can go down to around $45 a person, that is before fees, autoplay discounts and tax are factored in. Security deposit is another option that you can explore if you have poor credit ratings. With a security deposit, no credit check is performed. All you need to do is to pay the deposit. The deposit amount defers depending on your credit ratings and the service provider, and it can go as high as several hundred dollars. The deposits are made per line, therefore, if you need several lines per account, you will have to pay more deposits. Most cell phone providers usually refund deposits as long as the payments are made regularly and on time. You can also decide to be an authorized user on someone’s account. There are some companies that will permit you to register an account under somebody else’s name and they will then use that person’s credit score to offer you a contract. The person can then give you the go-ahead to make changes to the account. It is wise to do this with somebody that you trust. For example, you can talk to your brother and have a contract under his name but you’ll be the one making the payments. Note however that if you fail to pay, it is your brother who will be affected. It is more or less the same as a cosigner, as they are all putting their financial reputation and credit ratings at risk. Another important thing to note is that, although you will be the one making the payments, your credit score will not improve or increase, but it will be the account owner’s credit rating that will grow. As stated earlier, most of the service providers usually carry out a credit check on any person who applies or requests for a phone contract, particularly the ones that come with the handset. The more expensive the mobile phone is, the harder it is to pass a credit check. You might, however, be lucky with a slightly cheaper phone, as the threshold is not as high as it is with the expensive phones. You can also succeed if you opt to purchase a plan from a reseller rather than buying it directly from the network provider. This is also another ideal option for those people with poor credit record. If you have a poor credit, the probability of getting a sim-only contract is much higher as compared to getting a phone contract. This is simply because of the additional device cost, longer durations and the higher monthly instalments. You chance increases even higher if you opt for a 30 days plan. Most mobile phone providers don’t conduct credit checks on sim plans. One such network provider that offers a sim-only contract with no credit check is Giffgaff. This provider offers a thirty days bundle allowance with the option of extra bundle once you exhaust them. Some cell phone providers offer no credit checks and no deposit to its clients. This simply means that you don’t have to pay anything upfront. You will also not be subjected to any checks of any sort. Some options under the cell phones with no credit check no deposit include sim-only contracts, family plan and use of a cosigner. This is a brilliant plan that gives an opportunity to individuals with poor credit scores to acquire phones. It also boasts people rights to communication as it makes phones affordable all across the board. Improving your credit score can take some time to achieve, but with good credit management and timely payment of bills and debts, you will slowly but surely increase your credit score. Note that, an excellent credit score gives you more options on cell phone financing that you can choose from. It also makes it possible to acquire a more expensive and high performing phone that you might not get with poor or average credit. Improving your credit score is not easy and it takes time – time that you probably don’t have. If you are in such a position, there are various cell phones no credit check financing strategies mentioned above that you can consider. But before you do that, you need to find out about credit score and whether or not you can be able to get a contract with it. Additionally, you will also have to work towards improving your credit and increasing your credit score. This will only be possible by paying your bills on time, paying your debts and properly managing your credit card expenses. Additionally, you might also need to avoid situations that will further pull down your credit ratings. For instance, you may need to get rid of negative ties with a friend or former partner whose credit score is below average. Your friend poor credit score will pull you down, so it is essential that you inform them of the importance of maintaining or improving their credit scores.